Show#231 Interview With Nancy P. Romanyshyn A Super Mom Who Wrote a Mission Statement on Traveling With a Child With Autism!!! How do you get to Carnegie Hall?,” asks Norma Francullo. “Through the support of organizations, businesses, family and friends from Verona.” Read about how C.H.I.L.D. helped get the VHS band to Carnegie Hall here. 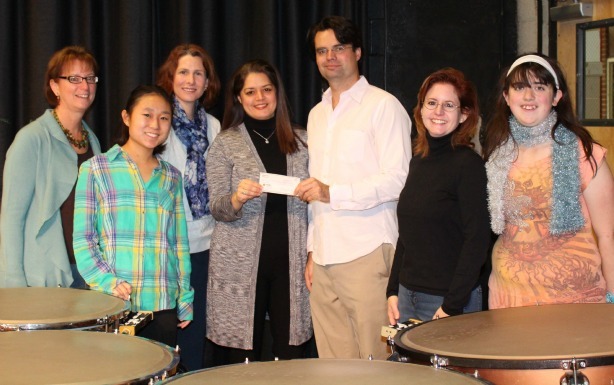 Pictured (l-r): CHILD Treasurer Kathy Zaccone, VHS band member Rachel Curcio, CHILD Secretary Meredith Goldstein, Norma Francullo, Erik Lynch, CHILD Co-Chair Nancy Romanyshyn, VHS band member Olivia Lewis.